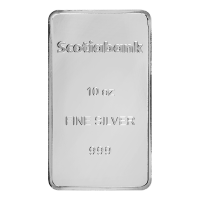 Buy 10 oz Scotiabank Silver Bars | ?? These bars are produced by a variety of mints for Scotiabank. These bars are a low premium, liquid way to build your wealth in ounces. 10盎司丰业银行银条 These bars are produced by a variety of mints for Scotiabank. These bars are a low premium, liquid way to build your wealth in ounces.